Early on August 6, 1945, a lone American B-29 Superfortress bomber circled in a vividly blue sky over the Japanese city of Hiroshima. The unsuspecting inhabitants on the ground barely glanced at the plane. They were unaware of the deadly payload it was about to unleash on them, ushering in the atomic age with unimaginable death and destruction. As one single bomb neared the ground, a city died in an instant. Houses crumbled, people evaporated, an immense ball of fire shot skywards, and a terrible wave of super-heated gas bulged out from ground zero, flattening buildings for miles. Amongst the unsuspecting inhabitants of Hiroshima was Fr. Schiffer, a Jesuit missionary assisting the many Catholics of that city. 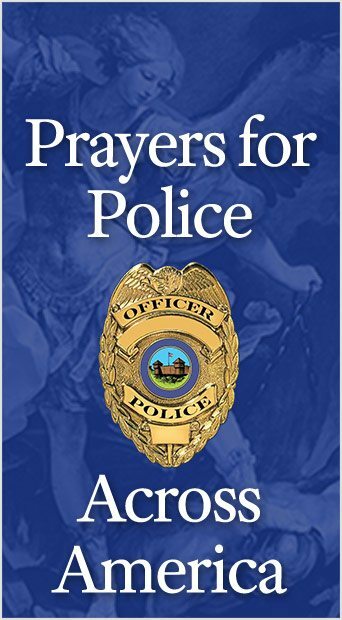 On the morning of August 6, 1945, he had just finished Mass and sat down at the breakfast table. As he plunged his spoon into a freshly sliced grapefruit, there was a bright flash of light. His first thought was that a fuel tanker had exploded in the harbor, as Hiroshima was a major port where the Japanese refueled their submarines. Then, in the words of Fr. Schiffer: “Suddenly, a terrible explosion filled the air with one bursting thunder stroke. An invisible force lifted me from the chair, hurled me through the air, shook me, battered me, whirled me round and round like a leaf in a gust of autumn wind.” Next thing he remembered was that he opened his eyes and found himself on the ground. He looked around, and saw there was nothing left in any direction: the railroad station and buildings in all directions were gone. Yet, the only harm to him was a few slight cuts in the back of his neck form shards of grass. As far as he could tell, there was nothing else physically wrong with him. The small community of Jesuits to which Fr. Schiffer belonged lived in a house near the parish church, situated only eight blocks from the center of the blast. When Hiroshima was destroyed by the atomic bomb, all eight members of the small Jesuit community escaped unscathed, while every other person within a radius of one-and-a-half kilometers from ground zero died immediately. The house where the Jesuits lived was still standing, while buildings in every direction from it were leveled. Father Hubert Schiffer was 30 years old when the atomic bomb exploded right over his head at Hiroshima. He not only survived, but also lived a healthy life for another 33 years! How did this group of men survive a nuclear blast that killed everyone else, even people over ten times further away from the blast? It is absolutely unexplainable by scientific means. An interesting detail is that this group of Catholic clergy was made up of ardent enthusiasts of the Message of Fatima. They lived the Message. Was their fidelity to Our Lady rewarded by this stupendous miracle of their survival? 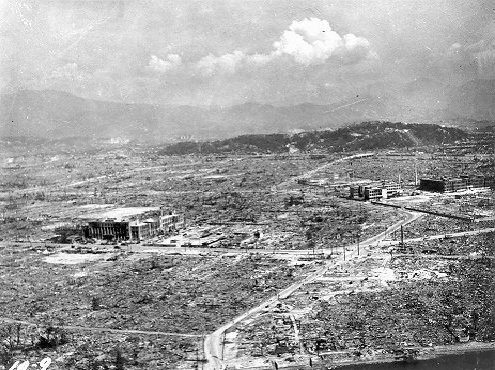 Even more astonishing is that the story was to be repeated a few days later at Nagasaki, the second Japanese city to be hit by an atomic bomb. 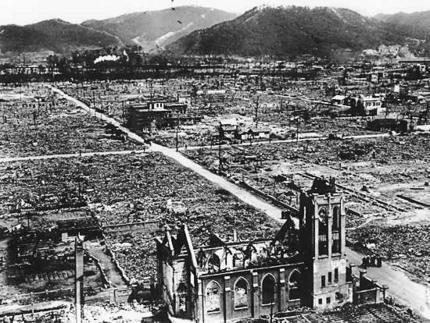 In both Hiroshima and Nagasaki the survivors were Catholic religious. Most other buildings were leveled to the ground, even at 3 times the distance, but in both cases their houses stood – even with some windows intact! All other people, bar a handful of scattered mutilated survivors, even at thrice the distance from the explosion, died instantly. Those within a radius ten times the distance of the Jesuits from the explosion were exposed to fierce radiation and died within days. After the American conquest of Japan, U.S. army doctors explained to Fr. Schiffer that his body would soon begin to deteriorate because of the radiation. To the doctors’ amazement, Fr. Schiffer’s body showed no radiation or ill effects from the bomb. All who were at this range from the epicenter should have received enough radiation to be dead within a matter of minutes. Scientists examined the group of Hiroshima Jesuits over 200 times during the next 30 years and no ill effects were ever found. Could it have been a fluke? Could the bomb’s makers have designed it to avoid killing U.S. citizens? There is no known way to design a uranium-235 atomic bomb so it could leave such a large discrete area intact while destroying everything around it. The Jesuits say: “We believe that we survived because we were living the message of Fatima. 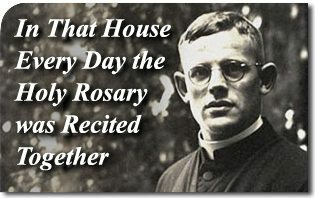 We lived and prayed the Rosary daily in that house.” Fr. Schiffer feels that he received a protective shield from the Blessed Virgin, which protected him from all radiation and ill effects. Fr. 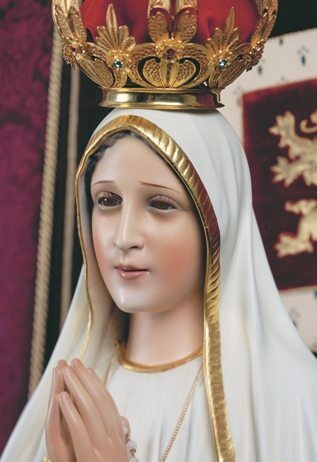 Schiffer attributes this to his devotion to Our Lady, and his daily Fatima Rosary: “In that house the Holy Rosary was recited together every day.” Secular scientists are dumbfounded and incredulous at his explanation. They are sure there is some ‘real’ explanation. However, over 60 years later the scientists still have not been able to explain it. From a scientific standpoint, what happened to those Jesuits at Hiroshima still defies all the laws of physics. It must be concluded that some other force was present, whose power to transform energy and matter as it relates to humans is beyond our comprehension. Dr. Stephen Rinehart of the U.S. Department of Defense is widely recognized as an international expert in the field of atomic blasts. Says Rinehart: “A quick calculation says that at one kilometer the bulk temperature was in excess of 20,000 to 30,000 degrees F, and the blast wave would have hit at sonic velocity with pressures on buildings greater than 600 PSI. If the Jesuits, at one kilometer from the geometric epicenter, were outside the atomic bomb’s “plasma” their residence should still have been utterly destroyed. Un-reinforced masonry or brick walls, representative of commercial construction, are destroyed at 3 PSI, which will also cause ear damage and burst windows. At 10 PSI, a human being will experience severe lung and heart damage, burst eardrums and at 20 PSI limbs can be blown off. All the cotton clothing would be on fire at 350 degrees Fahrenheit, and your lungs would be inoperative within a minute of breathing even one lungful of air at these temperatures. “No way could any human have survived nor should anything have been left standing at one kilometer. At ten times the distance, about ten to fifteen kilometers, I saw the brick walls standing from an elementary school and there were a few badly burned survivors; all died within fifteen years of some form of cancer. Reconnaissance pictures taken of a panoramic view from epicenter of the blast, at Shima Hospital looking towards the Jesuits’ house, did show some kind of two-story building totally intact, at least from what I could make out, and it looked to me the windows were in place. Also there was a church with walls still standing a few hundred yards away, but the roof was gone. Originally published in Britain Needs Fatima Members’ Newsletter, Issue 25, February, 2007. Britain Needs Fatima Members’ Newsletter is a publication of the Tradition, Family, Property Bureau for the United Kingdom. Please direct all enquiries to: Britain Needs Fatima, P.O. Box 2713, Glasgow, G62 6YJ. This entry was posted in Focus on History and tagged army, cancer, Catholic, Church, clergy, devotion, doctor, Fatima, focus, Hiroshima, history, Japan, Jesuit, live, message, missionary, Our Lady, priest, radiation, rosary, Schiffer, scientific, Shima Hospital, survivor, TFP by TFP.org. Bookmark the permalink.